Kleefeld on Comics: A Rights Issue Leading To Collectability? 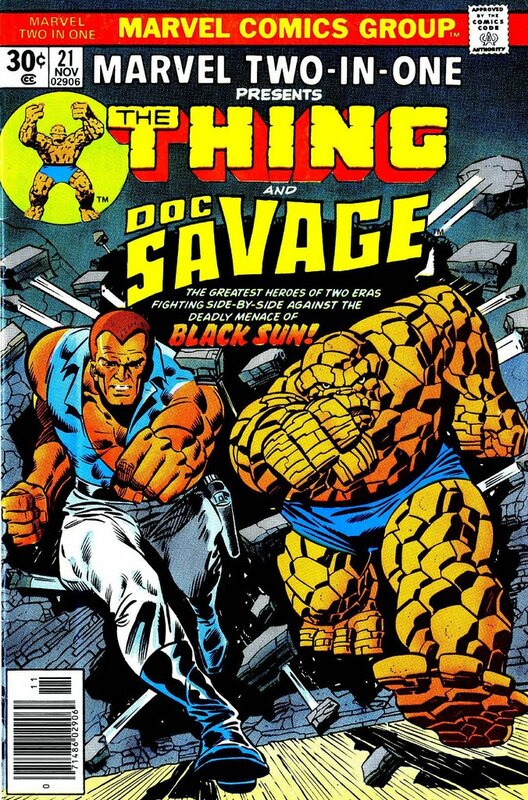 Of the 100 issues of Marvel's original Two-In-One series, #21 is the only issue that has never been reprinted in any form. If you want to read the story here, your only (legal) option is to track down one in the back issue bins. 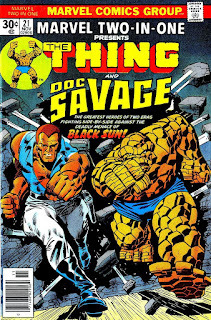 The reason for this is that Doc Savage appears as a character in the story and he's a character that Marvel does not own the rights to. In order to reprint this story, they have to secure permission from the current rights holder (who I can't seem to find in a 30-second internet search) and probably pay a handsome royalty fee. It's not impossible for that to happen, but with the number of intellectual properties Marvel already owns, sorting all that out just to reprint a single issue seems a bit much. I know Marvel's 2001: A Space Odyssey has some rights issues that keep it from being reprinted, and I'm pretty sure Rom, the Space Knight does as well. Marvel also can't reprint their adaptation of the Wizard of Oz movie despite having access to the Oz stories because the movie version specifically is owned by MGM. They're effectively in the same boat as MTIO #21: if you want to read these, start digging through the back issue bins. There are other similar cases from different publishers, I'm sure. Historically, not being reprinted has meant not being re-printed. As in, ink and paper and a physical copy being produced. Now, of course, reprinted can also mean a digital file. Publishers are slowly starting to realize this, I think, and are catching on (slooooowly) to the idea of selling their entire back catalog of material. We're definitely not at the point where you're a few clicks away from reading anything Marvel or DC has ever published, but I don't think it's that far off a prospect either. Except for these types of stories with rights issues attached. Until/unless those legal issues are addressed, those stories will remain out of circulation. Both in print and digital venues. Which leads me to speculate on the market for them. Comics shops used to thrive on the back issue market, but they don't use them nearly as much these with the number of reprints and digital copies being made available. Why bother paying an arm and a leg for Amazing Fantasy #15 when you can get a hardcover edition that also includes the first several issues of Amazing Spider-Man for a fraction of the price? Or, for a fraction of that, get a digital copy online? It's easier than ever to get a hold of that story. But those issues that still have a market value based on their unique quality, do they retain a higher collectible value because of it? Sure, copies of Amazing Fantasy #15 are scarce, but the story inside is not. Rom #1, on the other hand, is scarce issue (though not as scarce as Amazing of course!) AND it's a scarce story. That should, in theory, increase it's collectible value. So I wonder about the market for those comics. I think it's doubtful a comic shop could make a living just selling those types of issues, but they're not making much selling back issues in general. So if comic shops are shifting focus to collections, where do these obscure stories get sold? I don't have any real answers tonight, just some idle wonderings. Very interesting. I never thought of collecting that way. As someone with an interest in the stories, rather than the physical objects themselves, I wouldn't be interested in purchasing an Amazing Fantasy #15 because I could just read an Essential or a Masterworks, saving time, money and work. For people who collect first appearances, or #1's, the motivation in possessing those objects is historical. Even comics fans, who are actually interested in reading those comics, would love to possess a piece of comics history. A ROM #1 might be worth something because it's a #1, but the rest of the title's run might not. So, for people interested in collecting these, or the Marvel Micronauts run, or even the unreprintable MTiO #21, MTU #74 (cast of SNL) or MTU #79 (Red Sonja), I suppose collectors might be more interested in taking advantage of supply and demand. Historically-minded comics might want to read those out of a sense of completeness, but for collectors of physical objects, I don't think they'd want to keep these unless it was an investment. not surprised rom number one could be rare since a number one uselly is what most fans need to have. as for rom the reason it will never be reprinted is that the rights to the toy belong to hasbro under parker brothers and the creator of rom said he has no interest in working with marvel again. also would have put mircleman on the list even though marvel is working on that one. This is why we'll probably never see reprints of Master of Kung-Fu -- Marvel doesn't own the rights to Fu Manchu and the related characters. But they do own the character Shang-Chi, even though he's supposed to be Fu Manchu's son! Another unreprintable series held up by rights issues is 1963, where the creators have gone their separate ways. Yeah, some of these comics are becoming scarce on the back-issue market because people are beginning to realize that their only reading option is to buy the original comics. It took me a while to find a full run of 2001 (and the Machine Man follow-up), and I'd say that the issues were about 50% more expensive than comparable comics of the same era that have been reprinted (say, The Eternals). One comic that for years had its back-issue value boosted heavily because of rights issues was Superman vs Muhammad Ali. A copy in good condition used to sell for $50 or so, an outrageous amount for something which had a very high initial print run. I would not be surprised if the price has plummeted since DC got permission to reprint it about a year ago. You may be right about MOKF, although IIRC, I think maybe Fu Manchu was in an issue or two of Secret Avengers last year? It was clearly the character, and Shang-Chi's father, though maybe they didn't call him by name?